Humboldt State’s Student Sustainability Coalition marks Earth Week with a series of events April 18-20. 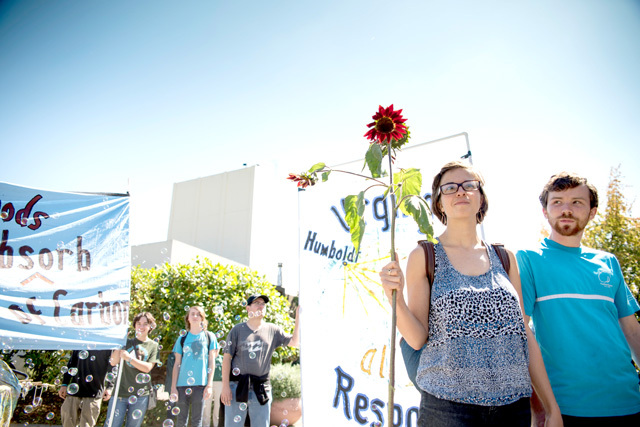 Earth Week events take place April 18-20 at Humboldt State. Wednesday, April 18, the focus is on Environmental Justice. The Climate Action Committee hosts two all-campus open forums to gather feedback on the upcoming Climate Action Plan strategy paper. The open forums are at noon and 3 p.m. in Goodwin Forum. Since 2014, members of the Climate Action Committee, chaired by Administrative Affairs vice president Joyce Lopes, have been working with various working groups to develop plans to reduce greenhouse gas emissions in several areas: Energy & Utilities; Solid Waste, Purchasing & Food; Transportation; and Curriculum & Research. Feedback captured at the open forums will be synthesized with recommendations from the working groups into a draft Climate Action Plan in fall 2016. The University will then be asked to ratify the Climate Action Plan in the fourth quarter of 2016. Also on Wednesday, the Student Sustainability Coalition investigates the breadth of the human impact of environmentalism in its Deconstructing Sustainability Forum at 7 p.m. in the Green & Gold Room. Thursday, April 19 features events highlighting campus energy use and how students, staff, and faculty can minimize their use of renewable resources. Green Campus hosts a PowerDown HSU where the campus community is asked to reduce its power use by shutting off unused office equipment, dimming lights, and other low-impact measures. Facilities Maintenance staff will shutter ventilation systems during the PowerDown.